Army cutworms are on the move. So far there have been no reports of damaging numbers of these insects and only low levels (below threshold) in Hitchcock and Chase counties; however, now would be a great time to scout for them in wheat and alfalfa. Because cutworms overwinter as larvae in the soil (in Nebraska), predicting the surviving populations and risk of damaging numbers from one year to the next is nearly impossible. However, scouting fields for this insect now and in the coming days could be good prevention. Figure 2. Army cutworm damage to wheat. Of all the cutworms in Nebraska, the army cutworm is the most damaging in western Nebraska. Economic damage from other cutworms, such as the pale western cutworm, dark-sided cutworm and variegated cutworm is rare. The army cutworm damages alfalfa, wheat and sugarbeet, as well as various rangeland grasses. Army cutworm larvae are greenish-brown to greenish-grey caterpillars, approximately ½ to 2 inches in length (Figure 1). Feeding damage from army cutworm larvae can vary from grazing leaf tips and chewing on the sides of wheat seedlings (Figure 2) to complete stand reduction. Last year, a grower from Lincoln County reported seeing higher than usual bird activity in his fields, especially in the early morning; birds will often feed on army cutworm larvae when they are in high numbers. Scouting for cutworm within this specific field indicated approximately 5 larvae per square foot, and the recommendation was made to apply an insecticide treatment. In late September and October, army cutworms lay eggs (1,000-3,000 each) directly on bare soil, such as in newly planted winter wheat or heavily grazed patches of range. After rainfall, eggs will hatch over an extended period, leading to a variety of caterpillar sizes feeding and developing as long as temperatures are adequate. When the weather turns colder, the caterpillars burrow down into the soil to spend the winter. Come April, large larvae can sometimes be abundant in winter wheat fields. In 2011, moderate populations of the adult army cutworm moth (or "miller moth") could be found in sheltered areas during the day. These moths contributed to a large population of larvae in 2012 and high populations in turn contributed to patchy populations above threshold in spring 2013 and 2014. However, in 2015 there have been no reports in western Nebraska of issues concerning army cutworms. Winterkill in wheat may have eliminated some of those concerns. As we continue into April and wheat breaks dormancy, this would be a good time to scout for cutworm activity. To scout for army cutworms, use a treatment threshold of 4 or more cutworm larvae per square foot of winter wheat or alfalfa. However, for stressed, thin stands of wheat or newly established alfalfa stands, use a threshold of 2 or more larvae per square foot. New or stressed alfalfa stands (for example, stands that suffered from some winterkill) require a lower threshold because they are more prone to damage from cutworms. Army cutworms only feed at night and seek out dark, sheltered areas during the day. Turn over clots of loose soil and residue for accurate cutworm counts. 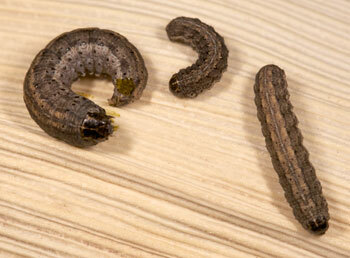 If army cutworm counts are above the threshold, consider an insecticide application. Always read pesticide instructions carefully before use.